Captain Stan Saffan is a lot of things. 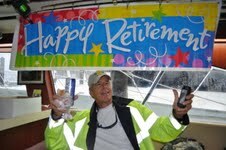 He is a sea captain with over 45 years’ experience in the waters off of Haulover Marina. He is an avid Philanthropist donated countless hours and dollars to Haulover Marina. He is a patriotic citizen volunteering to take Navy Men fishing during Fleet Week every year. To add to his wonderful qualities, Stan is the self-proclaimed “#1 Fan of the Miami Heat”. For every Heat Game, Stan inflates a large Miami Heat figure outside of his house in North Miami Beach. He also flies the Miami Heat flag from his two custom built Miami Deep Sea Fishing yachts. This year Stan has decided to prove his devotion to the Miami Heat by offering to take the Heat Players fishing for free. Not many sports fans put their money where their mouth is. Captain Stan will eat the cost of the voyage to give back to the Heat players what they give to Miami. The series with Boston is in full swing and Captain Stan is looking forward to the Heat bringing home a championship this year. The way the Heat has brought the city together over the last two years has affected every industry in a positive way. Captain Stan loves to talk “Heat” on the docks every day as passengers get ready for the experience of their lifetime. For now, Captain Stan will watch the Boston series closely and hope for a Finals birth. The fishing trip will have to commence when the team wins the NBA title. The THERAPY-IV, Miami Beach’s finest deep sea fishing yacht, proudly hosted the retirement party for Florida Marine Patrol Major Denis L. Grealish. 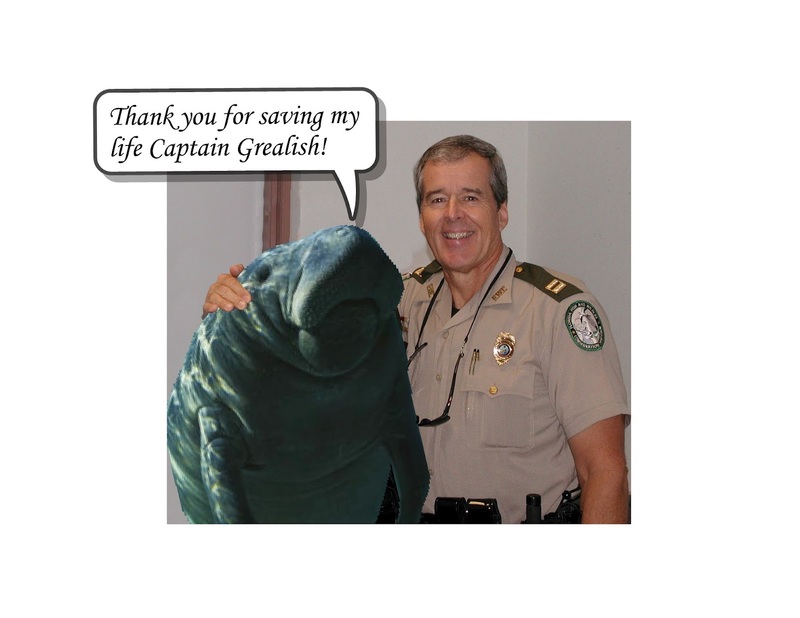 The celebration honored Denis Grealish’s 35-years of distinguished service as a Florida Marine Patrolman protecting Floridians and Florida wildlife. He was accompanied by friends, co-workers and the highly skilled Captain and crew of The THERAPY-IV on an epic deep sea fishing trip. The trip started off in inclement weather with winds up to 50 MPH and rough waters, but soon cleared up in time for some memorable fishing. The group took a leisurely ride up the inter-coastal waterway before returning to the bay for some serious fishing. They caught a couple Ameberjacks before Major Denis hooked a giant Tarpon – an exciting battle between the Major and a monster tarpon ensued. Major Denis Grealish brought the tarpon in and subsequently let it go. Overall, the event was a success. 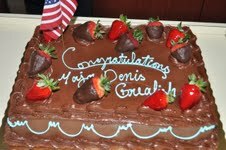 The Major’s friends and co-workers celebrated with a delicious chocolate cake, surprised him with a “Happy Retirement” sign and received souvenirs in the form of great pictures taken by Captain Stan of The THERAPY-IV. The THERAPY-IV is equipped with world-class fishing gear along with such creature comforts as indoor bar and flat screen television. There are two boats in Captain Stan’s fleet allowing for more trips to be taken per-day with both boats containing incredible amenities and features. Posted below are pictures from the epic trip. Anyone visiting the South Florida area, should take a half-day trip on The THERAPY-IV and create memories that will last a lifetime. But, if you still have energy left and would like to continue exploring the area besides Haulover Marina – we can definitely recommend some places depending on your preferences. Typically, those visiting Miami Beach enjoy eating, drinking, shopping, partying or all of the above. We definitely have great recommendations for all four. Eating – Miami Beach obviously has some of the finest dining options available. Finding any restaurant on the water promises the best seafood and other quality culinary dishes. Of course, you can always try Downtown Miami which isn’t far or Coconut Grove which is just past Downtown. Our recommendation would be the Rusty Pelican for a truly unique dining experience. Drinking – You don’t need to leave Miami Beach to find a good drinking place, and probably shouldn’t Ocean Drive is packed with places that are great for people watching and have some of the best beach drinks imaginable. If you are a beer person, there are plenty of beer bars in the area as well that have beers from all over the world. Wine is also in big demand in Miami Beach and fine wine bars are pretty much everywhere. Try Lincoln Road and Ocean Drive for the best places. Shopping – Lincoln Road comes to mind for anyone looking for a great shopping experience. Of course, world-famous Aventura Mall is not far either. Miami Beach has some of the finest brand name stores and places you can get truly unique apparel, shoes and more. Partying – There’s no need to mention the fact that South Beach is a party place. It’s almost engrained in the name. South Beach is one of the most active and fun places in all of South Florida. THERAPY-IV has celebrated 45 Memorial Day weekends in its existence and the Captain and crew know it is a great weekend for deep sea fishing. Luckily the THERAPY-IV has a fleet of ships capable of catering to more than a dozen trips this weekend. Friday, Saturday, Sunday and Monday will all be very popular days for deep sea fishing. If you are looking to go on a bachelor party trip, birthday celebration, or just a great Memorial Day Weekend Miami deep sea fishing excursion – book today. 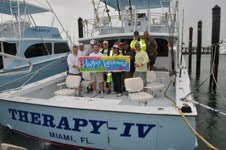 There’s another reason THERAPY-IV is such a popular charter sport fishing yacht on Memorial Day Weekend. THERAPY-IV is known for its stellar record in supporting the military and when military-related holidays like Memorial Day come around – fishing enthusiasts typically stop by the Haulover Marina to go on trip with Captain Stan and The THERAPY-IV. Not only is Memorial Day a popular time to go deep sea fishing, but it’s also a great time of year to catch some of the most exciting big game fish like Marlin, Tuna, Sailfish and more. 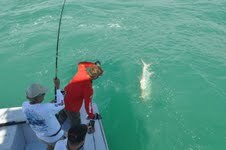 Miami sailfishing and Miami shark fishing are possibly the most popular outings for which to partake. Sailfish are incredibly fast, powerful and beautiful. Sharks are, of course, the most dominant predators in the ocean and are incredibly strong aggressive and exciting to fish. The THERAPY-IV was recently in the news for donating their boat to the “Take a Hero Fishing” tournament in Fort Lauderdale during Fleet Week. They have also donated an American flag mural to Haulover Marina and flag pole. The THERAPY-IV has been operating out of the Haulover Marina in Miami Beach for 45 years Captained by Stan Saffan. They have a fleet of sportfishing charter yachts with indoor bars, flat screen TVs and the finest fishing equipment available. Miami Beach is a well-known tourist destination with some of the finest beaches, restaurants and entertainment available in the world. This South Florida hotspot has plenty of outdoor activity during its year-round warm weather and long beautiful coastline. One particular activity adventure seeking travelers partake in is deep sea fishing. Of course, you can deep sea fish in many parts of the country – so why choose Miami Beach? That’s a very good question and we have three good answers for you below. Deep sea fishing implies riding a boat out to deep sea waters. For places all along the eastern seaboard that means a six-hour trip to deep waters where there are incredibly large fish. However, Miami Beach’s unique location provides a short trip to be in waters that are fishable for marlin, big tuna, tarpon and more. That means less time traveling and more time fishing. This increases your chances of catching a big fish and makes the trip more enjoyable. Where else are you going to find sport fishing charter yachts with captains that have 45-years-experience and boats with flat screen TVs and indoor bars? Captain Stan of The THERAPY-IV is one of those captains. Not only does his boat have the kind of technology that makes catching fish a certainty but he also has some incredible onboard entertainment. If you are making a weekend out of your deep sea fishing trip – why not spend that weekend in Miami Beach. There is something to do for just about anyone here in Miami Beach. If you have an active nightlife – Miami Beach has some of the best bars and nightclubs in the world. If you want to spend a day or half-day by the beach or pool – Miami Beach is one of the best placed to do that. For a quality time deep sea fishing in Miami, visit the Haulover Marina and take a trip on the THERAPY-IV. 3 Reasons that Fishing is Awesome! 1. You never know what you’re gonna get- No matter how experienced the crew aboard the Therapy 4 are or how well they master the art of fishing, you can never predict to the approximate species what will bite. Some of the types of fish we catch are the Hammerhead shark, the Sailfish, Wahoo, King Fish, Miami Marlin fishing and Tuna. 2. Memories- There are certain activities that develop long term memories with our loved ones. Many of the customers that come on board the Therapy 4 are Fathers and Sons, Mothers and Daughters looking to create a memory of fun and thrilling experience. There is nothing else like deep sea fishing in Miami and the memories last forever. 3. Adventure- Every time you go fishing, you are embarking on an adventure to seek out the biggest deep sea fishing monsters that the waters of Miami Beach have to offer. It is incredible to think that you may go out there and set a fishing record for a largest species ever caught. The next time you consider an activity, think about the surprise, memories and adventure that awaits you aboard the THERAPY-IV!! Golf, smoking cigars and fishing have always been ways people (particularly men) have been able to bond over the years. More and more people are finding Miami deep sea fishing excursions to be ideal for sharing experiences with your friends, brothers, sons and fathers. The half day trip is just enough time to enjoy the company of your loved ones without overstaying yours or their welcome. Additionally, souvenirs in the form of pictures or even trophy fish are wonderful reminders of a great time at sea with those you care about. Listed below are the top three bonding experiences while deep sea fishing. More and more bachelor parties are choosing to spend their day deep sea fishing for sailfish, tarpon, sharks and more. This is ideal since it provides an isolated yet active trip for old friends to share stories and new experiences. Additionally, since this is a day trip – it doesn’t interfere with any planned nighttime activities. Fathers and sons have been going on fishing trips for hundreds of years. It can be difficult at times for fathers and sons to communicate so things like playing catch, fishing or going to a baseball game are great for breaking barriers. Father son trips happen a lot on The THERAPY-IV and typically result in them catching a big fish and getting a great picture to keep forever. Girls typically prefer “Girls Night Out” whereas guys prefer daytime activities like deep sea fishing. These guy trips are extremely convenient, fun and affordable. It is becoming more and more common to see half day trips with a group of guys mixing old friends, new friends and colleagues. The Coca Cola Company has supported the United States military veterans dating back to the 1940’s. Setting aside 800 jobs across the United States for veterans, Coca Cola has expressed the need for specific skill sets and leadership abilities that military personnel possess. According to President and CEO Steve Cahillane “Our military personnel have made incredible sacrifices to serve and protect their country and when they return home, they deserve support and recognition from companies like Coca-Cola". Currently, Coca Cola employs over 5,500 veterans across all 50 states, "Coca-Cola Refreshments recognizes that our military provides a strategic, qualified talent pipeline for our organization," added Cahillane. "Recruiting military veterans is not just the right thing to do, it's also the smart thing for our business. Veterans who join the Coca-Cola team will play a critical role by using their valuable experience to help us share moments of refreshment with people across our country." The Coca Cola Company first began its support of veterans in 1941 when the former President of Coke pledged to see every man in uniform with a bottle of coke for 5 cents. The THERAPY-IV Fishing Yachts have been deeply committed to helping veterans whenever possible. From shooting the outdoor channel show with Greg Stube, to volunteering for ‘Take a Hero Fishing Tournament’ and most importantly taking veterans fishing for a great day of deep sea fishing in Miami Beach. More businesses across the nation need to take responsibility for making an effort to hire veterans and (as mentioned earlier in the week) their spouses. For more information on big game fishing on the THERAPY-IV, be sure to visit their website. Continuing Military Week, the THERAPY-IV would like to write an entire article about the spouses of military servicemen and women. Their dedication and service is not on the rifle range or on the field of combat but they endure a variety of sacrifice. o Military spouses tend to hold the same job for the entire time of their spouses assignment. This averages between 2-4 years compared to just over 1 year average turnover in the private sector. It is our duty to support our troops in war time as well as peace time. It is our duty to help the families of our servicemen, especially in wartime. As we continue to honor the military this week, we hope we can inform people of ways they can help!